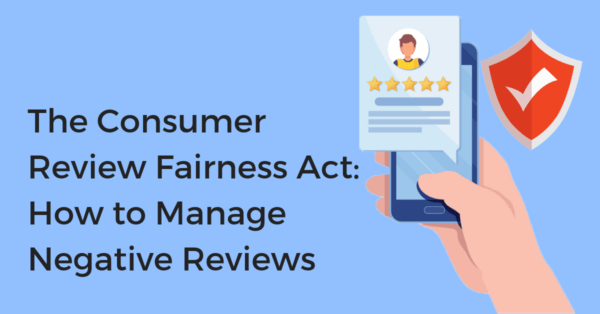 The Consumer Review Fairness Act protects consumers’ ability to share their honest opinions about a business’s products, services or conduct in any forum, which includes social media. The CRFA took effect on March 14, 2017. The CRFA makes it illegal for businesses to threaten or penalize people for posting honest reviews. According to the act, it is the brand’s responsibility to follow the CRFA compliance when managing their reviews. The CRFA was passed in response to reports of some businesses trying to prevent people from giving their honest reviews about a business’ products and services. 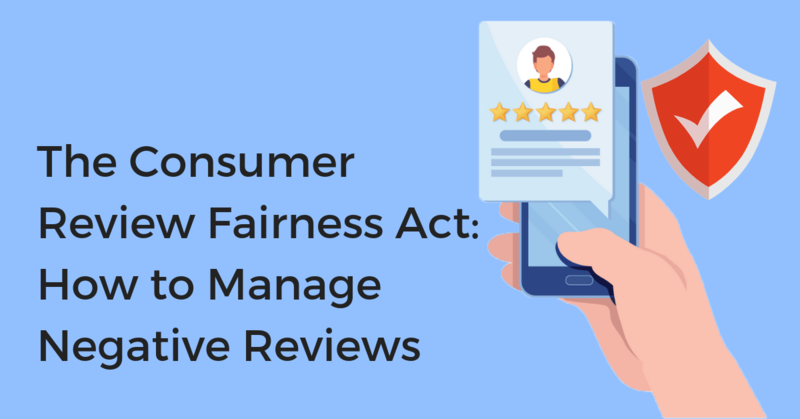 Some companies tried putting contract provisions in place that allowed them to sue or penalize consumers for posting their negative reviews. Here’s our guide for how your brand can comply with the law and manage your negative reviews. Is Your Business CRFA Compliant? Review your form contracts including online terms and conditions. Make sure there aren’t any provisions that restrict people from sharing their honest reviews. Your business cannot penalize those who share their reviews. Your business cannot claim copyrights over people’s reviews. In short, the CRFA compliance means you’re not prohibiting customers from sharing their honest opinion about their experience with your brand. Chatmeter has been very clear on their stance against review gating and since reviews make up 15% of how Google ranks a local business, we always see more value in letting customers share their honest reviews instead of trying to hide them. The Federal Trade Commission and the state Attorneys General have the authority to enforce the CRFA. Any violations of the CRFA are subject to financial penalties as well as a federal court order. It would be wise to comply with the CRFA and allow consumers to leave honest reviews about your business. What Reviews Can Businesses Remove? There are a handful of instances in which you can remove a review. According to the law, you can remove a review that contains confidential information, is harassing, abusive, vulgar, sexually explicit, inappropriate regarding race, gender or ethnicity, is unrelated to your business’s products or services, or is clearly false or misleading. Google, like many other review sites, has 9 violations that allow businesses to remove negative reviews. When you remove bad, negative, and fake reviews that are in violation of Google’s Review Policy, your company can improve your ratings, rankings and eventually increase your customer visits. Multiple negative reviews from the same person. Inappropriate content, profanity and racial terms. Leaving reviews at locations they didn’t visit. Reviews from current or former employees. Reviews that aren’t relevant to an actual experience. The CRFA is a big win for consumers. Consumers can now openly post and share their honest reviews about a business in any forum including all social media sites. Consumers no longer have to fear retaliation for posting a negative review of a business. Businesses should see this act as an opportunity to engage with their customers online by responding to positive and negative reviews. 46% of customers who leave a comment or review on a business’ social page or post expect a response within 6 hours. Whether the review is positive or negative, it’s important to respond to the review quickly to show your customers you are committed to customer satisfaction. Nowadays it only takes a few bad reviews or social comments to completely bring down a business’ reputation. Your brand’s reputation means more than anything and responding to negative reviews is crucial. Responding to every review can be demanding and time-consuming without a review management software to monitor them for you. Monitoring your reviews is essential to managing your online reputation. This will allow your business to react and respond quickly to customer complaints. Businesses can only benefit from responding to negative reviews. Here are some helpful tips on how to respond to negative reviews. Apologize and thank them for their feedback – Negative reviews can often give you more insight than positive reviews. Thank the customer for giving an honest review and be sure to apologize for their poor experience. Your business can then take that feedback and make improvements. Respond appropriately – No matter how rude a customer may be in their review, you have to remember this is public. Never blame the customer. Your response always matters to your current and future customers. Invite the conversation offline – Don’t go back and forth with an unhappy customer on a public site. Give them a phone number or email where they can keep in touch with customer service. Short and sweet – Keep your response short. No need to say more than needed or draw more attention to the negative review. Remember when responding to negative reviews, 33% of people will turn around and post an updated positive review about the resolution and 34% will delete their negative review. To be completely successful in monitoring your reviews, you need to continuously respond to all your reviews and remain CRFA compliant. Managing your negative (and positive) reviews while being CRFA compliant doesn’t have to be hard or stressful if you have a system in place. Chatmeter helps multi-location brands and agencies monitor and manage their reviews all from within an easy to use dashboard. Ready to take control of your reviews? Click here to schedule a free brand audit.